These top the list of scary looking things to eat. Yea, they look like freaky black horns and if you look closely, there’s a little bit of hair on top. Eww. So when Jen found some at the Chinese supermarket, she bought some and asked me, “what the hell are these things?” I remembered seeing my mom with these and so I asked mom. me: What is it in English? Mom: There’s no English. Americans don’t eat this. me: Well, there’s still some scientific name right? Can you look it up in the Chinese-English dictionary? Mom: (after looking) It’s not in there. Mom: It grows in water, at the bottom of something like lily pads. me: How do you eat it? I boil it for 20 minutes. Then I try to cut into it and can’t so I call mom. me: Mom, how do you cut it? Mom: We used to just bite it with out teeth. If you don’t want to, just cut it down the middle and then get the white stuff out. me: But, I can’t even cut it. Mom: After you boiled it, did you rest it? me: No, you didn’t tell me to. Do I rest it in the cooking water? Mom: No, dry, leave it dry. me: Ok. so boil it for 20 minutes, then rest for how long? Mom: I don’t know, another 20 minutes. While still hard to cut, they now do slice in half, and then the easiest way to get the inside out is to bite down and squeeze it out. They taste like a cross between chestnuts and water chestnuts, both in taste and texture. While I love chestnuts, I don’t like water chestnuts, which leave these at ehh for me, but I will serve them at Halloween, just cause they look nice and scary to eat. 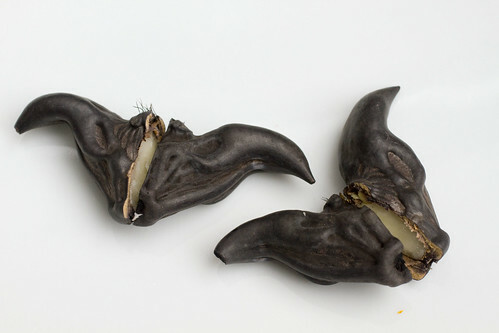 *updated at 9:47pm: we found out that they’re called Water Caltrop. posted by jessica	at 03:21 PM	Filed under Basics. You can follow any responses to this entry through the RSS 2.0 feed. Both comments and pings are currently closed. haha, i love these! i don’t like the weird crunchiness of water chestnuts, definitely more of a fan of chestnuts. but i guess growing up with ling jow before either gives me the sentimental attachment. my mom used to buy a pound of it, and boil them. then we’d sit in front of our tv, crack them open with our teeth, then pick out the contents with a tooth pick. competing for who gets the most complete pieces out! Chocolate Shavings, I guess beauty is in the eye of the beholder. Very weird, cool, interesting all at the same time. However, the close-up picture showing the hair really grosses me out – yuck! Great story. Yeah they taste so so, kinda like a brazil nut, I thought. But too much of a pain to eat. I had these at a Pho restaurant, we were eating our pho and the owners were chowing down on these things, they saw our interest and shared. meh. I remember these! My parents use to cook them. 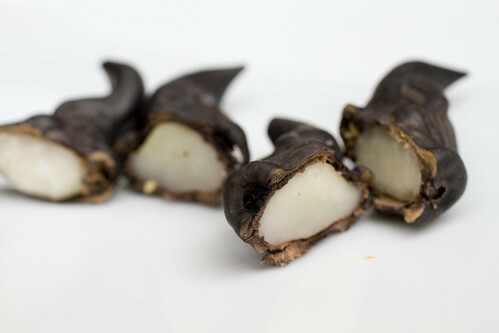 We never had them that often..
I’ve seen these called “Devil Pods” in the Asian market near me. Always wondered what the heck to do with them. Wow, I’ve never seen anything like this! They sure look scary but I would try them even if only once! My mom used to make these also. The one in the middle, really has the likeness of a cow. Totally gross and scary! What an interesting find. Fascinating! I thought it was chocolate at first. Wow, I love the mix of people who’ve eaten these (validating that it’s edible) and the surprised (makes me feel like I shared something new). Thanks! Not sure I would like these… Not a fan of water chestnut… Like Anne, I would probably go for it if it was chocolate!! Hah! I found some a couple years ago and was told they were called Trai Au. Oh my gosh- how interesting!! These look absolutely terrifying! I want to taste them! wow I haven’t seen these in ages! I normally just bite it open. Then again, they are not really my thing too. Those look very cool! I’ve never seen anything like them. Wow, they look sinister… like a cross between bats and gargoyles. But I definitely do want to try them. I love chestnuts and water chestnuts. Interesting Mary Sue, probably a different language. Koko, do you have any Chinese markets by you? Those do look devilish. 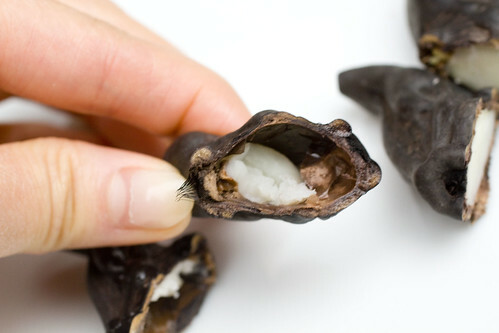 I’ve seen them at the store and wondered what they were but a friend told me they were just like water chestnuts. Thanks for explaining how they taste. Now I really need to try it for myself! Oh my goodness! I totally remember my mom buying these when we were kids and feeding them to us. It’s been years since I’ve had them, but I remember them just tasting sort of starchy inside. OMG. Those look evil. Never have seen them before! I wonder what would be more scary…real horns or fruit? this is so fascinating! thanks for posting. thoroughly enjoyed learning something new! would love to try it. My gawd, I’ve never seen these before. 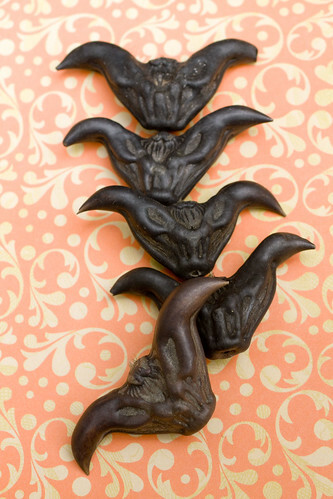 When I first saw the photo, I swear I thought they were like licorice bats! How crazy is that? Oh my gosh! I haven’t seen these for ages!!! I use to eat them as a kid during the midautumn festivals. Jeff, very interesting. I was not aware of Choson Ninja. Siewping, Wonders mentioned eating them at midautumn festival too, and I never knew it was one of the associated foods. I first came across these shortly after moving to Singapore. The one thing I haven’t seen mentioned here is their smell. The ones I handled in the grocery store had a swampy smell (perhaps even a wiff of cow or horse dung). SM, how interesting. They don’t smell here, probably cleaned thoroughly because people would be more repulsed here. 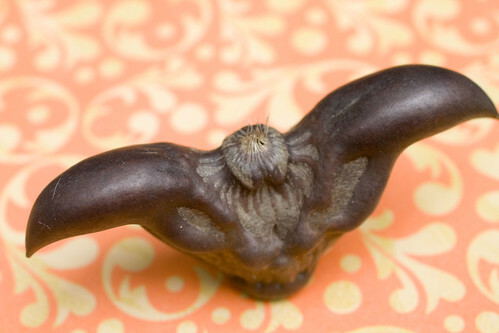 I first saw these in San Francisco’s Chinatown then years later found a whole lot of them washed up on the shore of the Hudson River up by Poughkeepsie, New York. They are considered to be invasive plants in the USA. They don’t seem to be bothered by icy winters. Wow, when I first saw these, I thought they were little chocolate Gremlins, like from the movie. They look awesome!